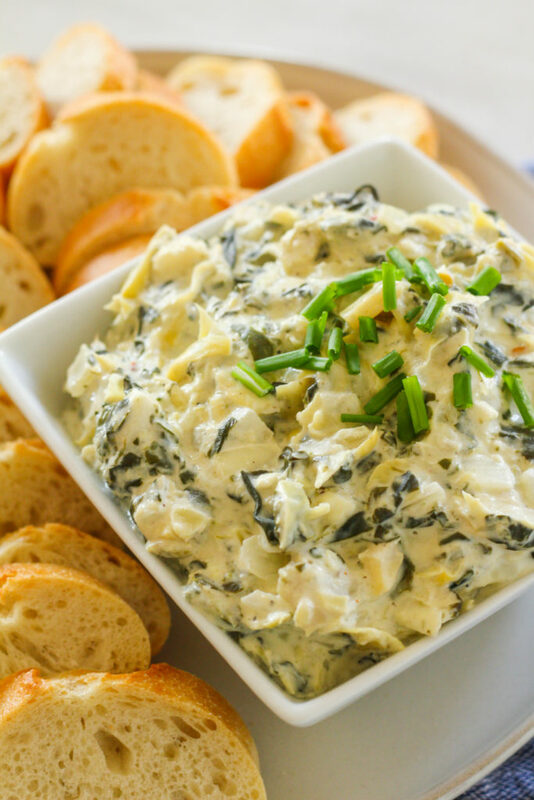 A toss it and forget it appetizer, this Slow Cooker Spinach Artichoke dip is perfect for your holiday party. 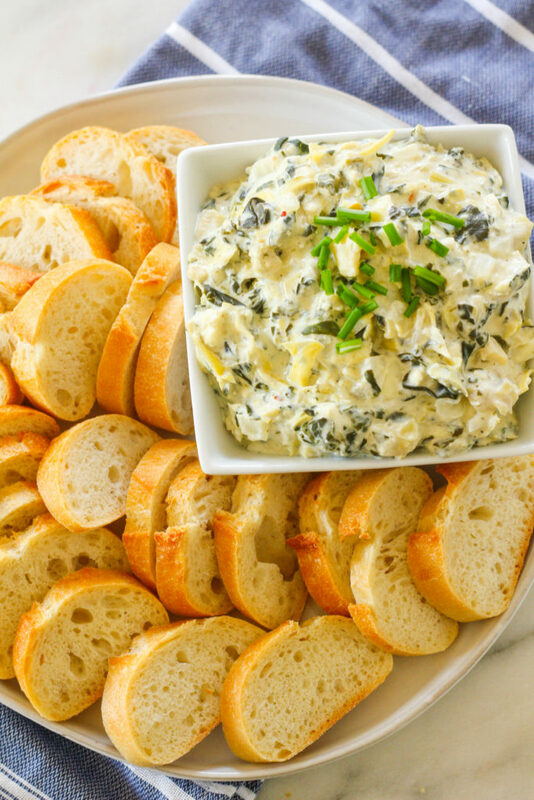 Just combine the ingredients in a slow cooker for two hours and you’ve got a delicious and healthy party appetizer! We’re just twenty days away from Christmas! Are you planning a party this year? Or are you attending one? 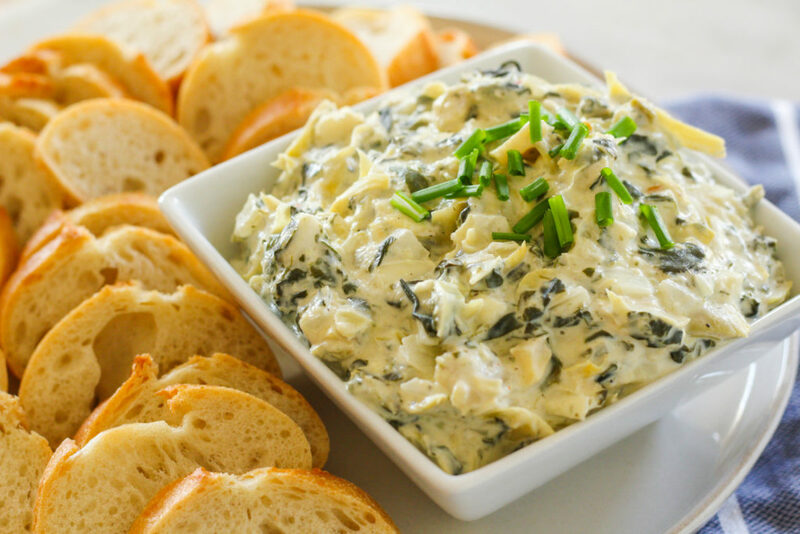 One of my favorite party appetizers (and my favorite appetizer to order at a restaurant) is spinach artichoke dip. It’s so delicious and hard to mess up! For this recipe, you simply throw everything into the crock pot and let it cook on low for two hours. It’s great if you’re hosting a party and need something easy for snacks that you don’t have to babysit! This recipe uses roasted garlic, which amps up the savory garlicky flavor. To make roasted garlic, you simply slice the top off the head of garlic, drizzle with olive oil and wrap in foil. Then, toss it in the oven at 400 F for 30 minutes and it comes out perfectly roasted– soft and rich in flavor, with the texture of butter. A side note — if you live in the Dallas / Fort Worth area, I will be demoing this recipe along with two other holiday appetizers next week! You can register for FREE for my Healthy Holiday Appetizer demo at Sprouts Farmers Market in Frisco, on 12/13 at 6pm. Preheat your oven to 400 F. Peel off the loose outer layers of the head of garlic. Slice off about 1/4 inch off the top of the garlic head. Drizzle a couple teaspoons of olive oil over and cover the bulb with aluminum foil. Bake for 30 minutes. Let cool, and use 2-3 of the roasted cloves for the dip. 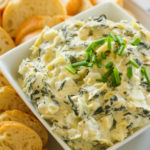 Place 2-3 cloves of roasted garlic, artichoke hearts, spinach, sour cream, onion, garlic, Parmesan, milk, feta, vinegar, lemon juice, salt and pepper, and red pepper flakes into a slow cooker. Stir until well combined. Top with cream cheese.